The black PRO 900 is our reference headphone for the professional sector and has already proven its high quality sound performance in practice all over the world. The PRO 900 offers professional and unlimited sound performance. This is the first closed pair of Ultrasone PRO headphones with the patented S-Logic Plus technology. S-Logic™ Plus is the newest advancement in the S-Logic™ Natural Surround System. S-Logic™ Plus profits directly from innovations developed for our flagship Edition range, the ultimate headphones for critical listening. This sophisticated new technology combines precision dampening with micro-acoustic reinforcement, allowing driver, buffer-board, and spatial parameters to complement one another in an optimal manner. So the acoustical design of S-Logic Plus models and their tonal fine-tuning result in maximum neutral sound impression with more vivid perception of voices and instruments. PRO headphones stand for Ultra Low Emission (ULE-technology) with significant benefits for professional users and PRO headphones show a specific design. The PRO 900 appearance does not only distinguish the professional line but also allows due to more ear anatomy area a higher degree of transparency in combination with the spatial sense and understanding. The PRO 900 headphones offer an additional possibility to choose a black pair of PRO headphones with black and silver velvet earpads. To understand what ULE-technology does, you need to know that most headphone drivers produce low-frequency magnetic fields as they convert an electric signal into an acoustical signal you hear as music. 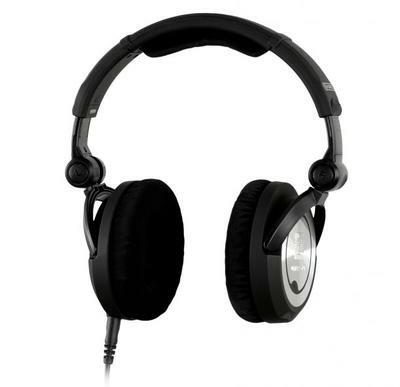 In response, Ultrasone developed a special MU Metal shielding (ULE-technology) to reduce the radiation by up to 98% compared to current headphones. The ULE-technology has stood the test of international review and is recommended by technical surveillance organisations. Ultrasone originally developed the ULE-technology for professionals as they do spend half of their lives in headphones. But due to grand requests the ULE-technology has now been integrated in other Ultrasone headphone lines. S-Logic™ does not only create a Natural Surround Sound. S-Logic™ allows at the same time a reduction of sound pressure levels by up to 40% (3-4 dB) for the same loudness sensation. This may reduce the risk of hearing damage while ensuring hours of fatigue-free listening. However, Ultrasone generally advises not to listen to music at high volumes to prevent hearing damage.